AU - It's been nine months since Edward fled the woods in Forks, fled from her for her. Each day his willpower crumbles a little more, feeling the insistent pull to return to her side. Upon returning, Edward is unable to locate Bella ... she's not with her friends, not at home, not even at the Cullen home. Upon finding the shell that once was Bella, Edward feels his heart ache for the pain he has caused her. Promising himself that she will not see him, he steals one kiss from her. The night explodes into a passionate reunion leaving both significantly changed. Will Edward convince Bella that it was all a dream? Has she really gone crazy, pushed herself to the limit? The day in meadow didn't go as planned. A second too late, an impulse too strong. What comes after you've lost your life? Where do you look to find hope again? When Edward returns to Bella of his own accord, he does not realise that just a few hours earlier she nearly drowned in an attempt to hear his voice. He soon finds that the girl he came back to is indeed very much altered from the girl he left behind, and that it takes more than saying sorry to rebuild their lives. 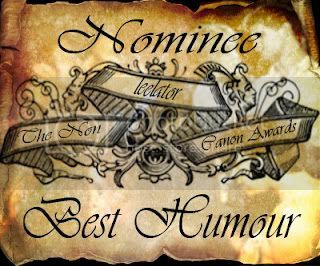 Thanks to Annamorphos for providing the banner! In canon through most of Eclipse, then I take over. Two weeks before her wedding, Bella is called home to Phoenix because her mother is in a horrible car accident. After several months of caring for Renee, Bella is heart broken when her mother dies. Grief-stricken, she flees Phoenix and moves to New York for college. Seven years later, she is called back to Forks to bury her father after vampires murder him and Billy Black. 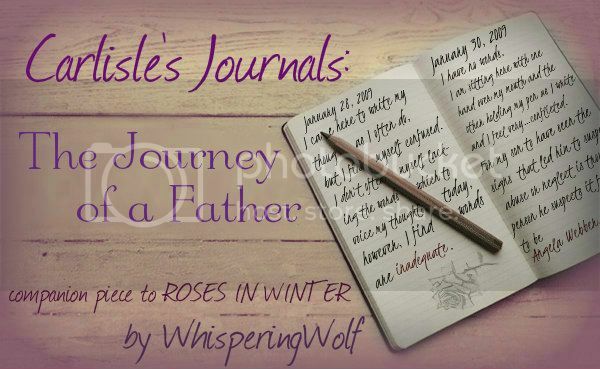 For those of you who have read Roses in Winter, this is a companion piece to that. For those of you who have not read Roses in Winter, I highly suggest that you do, before you continue reading this. Carlisle’s Journals are not a retelling of the story, nor do they entirely parallel the story chapter for chapter. This story tells the emotional journey that Carlisle took throughout the story in a collection of journal entries. Though the language that is used herein will lack profanity, the journal entries will still maintain the sensitive subjects discussed within Roses: child abuse, stalking, serial killers, and neglect. No time frame for continuation. 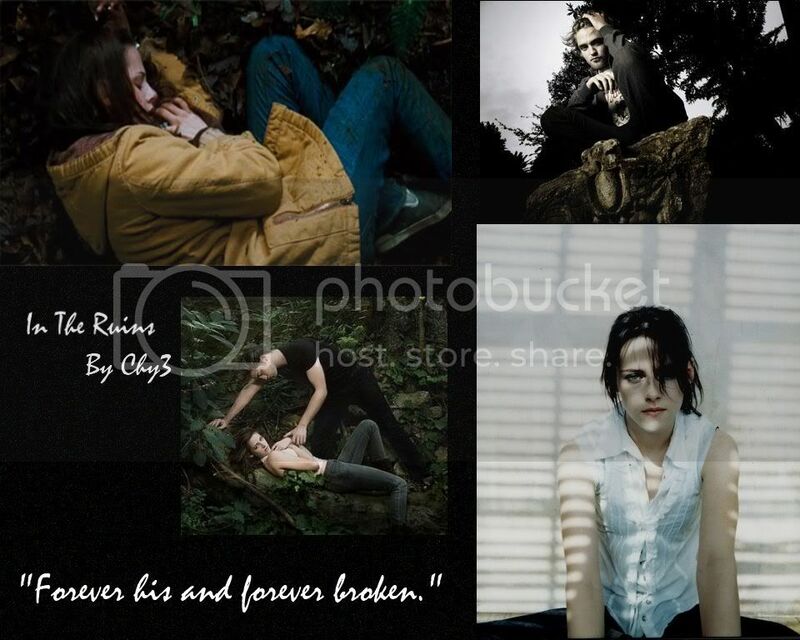 AU set after the events of New Moon. Instead of staying in Forks, Bella and the Cullens left following the confrontation with Jacob in the woods. Then, ten years later, still human, and with the Volturi seeking to kill her, Bella returns to Forks, seeking the help of the one person she knows will never turn her away. 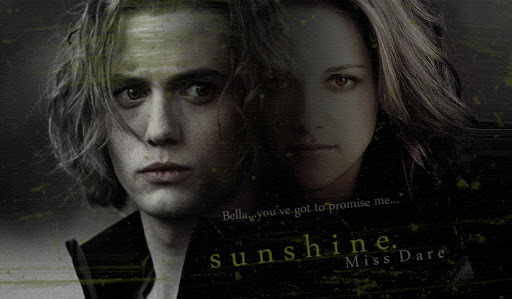 Jacob/Bella, though there will be no Edward bashing. It's been almost a year since Edward and the Cullens left Forks, and Bella is now beginning a new life as a freshman at Syracuse University in New York. 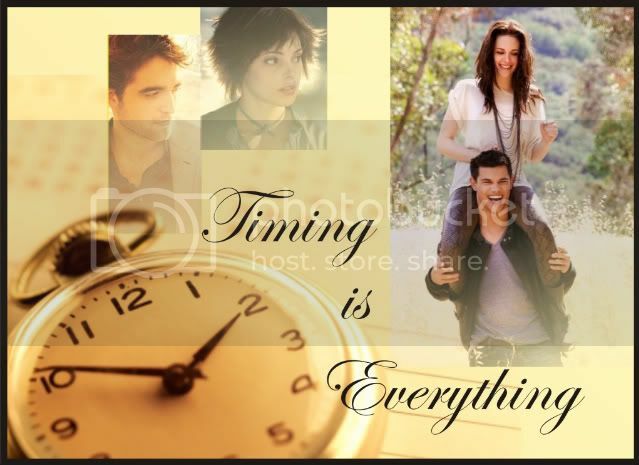 Although Bella thinks that this will be a fresh start, fate has other ideas in mind - or is it a certain vampire? Thanks to TwistedInMasen for the beautiful banner! A middle-aged Bella reflects on her life after Edward leaves. Does time really heal all wounds? AU-New Moon. Picking up in New Moon with Bella and Jacob in the kitchen after the cliff jump. What if the phone call from Edward hadn't interupted thier kiss? "His agony defines him. His memories destroy him. But his hope is what sustains him, feeds him, encourages him. It's his purpose. And he doesn't deny it. Offered the chance to leave all pain and misery behind, Edward knew that it was better to suffer his loss than to forget it. For in having it, Bella remains his and only his. To forget would be the ultimate betrayal, abandoning her once again to a world of lonliness and despair. He had already done that once upon a time, and he did so spectacularly. He'll find her. He has to. Bella jumps off the cliff, but she doesn't come out unscathed. Her mind is wiped clear of all her memories. Her family, friends, everything. As she struggles to recover, she is haunted by vivid hallucinations of a bronze haired boy who is quickly stealing her heart. Nearly three months after the Cullens left Bella back in Forks, Alice is in trouble. Jasper fears that he might lose his love forever. However, there is a way to save her, but it is fraught with danger, and only one person can help ... Bella. How will this end up affecting Bella? Will she be reunited with Edward and the Cullens? Will she be reunited with her true love? Or will she find that because of her actions, things have changed dramatically? Only ..."Time Will Tell ." Canon Pairings ... to start off the story. But, will everything remain as it once was? Only "Time Will Tell." This Story is written entirely from Bella's point of view. JUST REMEMBER, WHEN IT COMES TO THIS STORY, NOT ALL IS AS IT SEEMS. I SINCERELY HOPE YOU ALL GIVE THIS STORY A CHANCE. I TRULY BELIEVE THAT YOU IF YOU DO, YOU WILL BE PLEASANTLY SURPRISED. 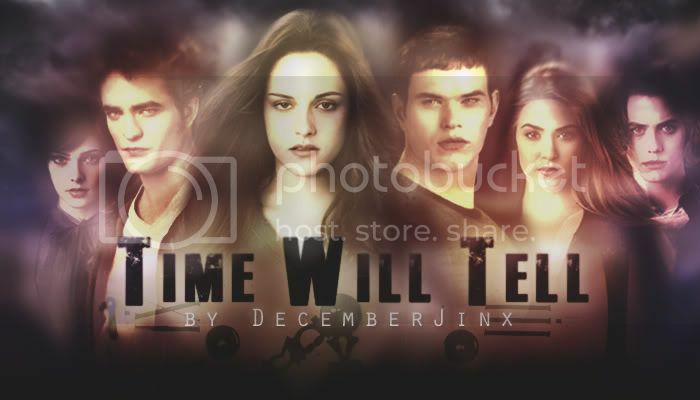 I ASSURE YOU... "TIME WILL TELL," WILL BE UNLIKE ANY OTHER STORY THAT YOU'VE EVER READ! SO, HOP ON THE STORY-TRAIN, AND ENJOY THE WILD RIDE...AND IT WILL BE A WILD RIDE...PROMISE! Thanks to Echanted_Mind for creating the awesome story banner! She is a true artist! Set in 2010, the supernatural world is in a crisis unprecedented, its' very structure challenged by a force yet to be seen. As this new threat sends ripples of discord and panic throughout the ranks, a young vampire and her two children, twin beings as different as light and dark, struggle to remain hidden in the shadows; away from the world they belong to. But not for long: Embittered by the desperate state his father left him, his mother, and his sister in five years prior, Tony Swan yearns for purpose; an opportunity to let out who he truly is. No more lies. No more veils. He won't have to wait long-as his sister grows normally, he inches closer and closer to adulthood, mind and body rapidly maturing despite the few years he has walked this Earth. And yet, throughout all this, one key fact remains forgotten by the young hybrid: fate's plan is never simple. And in a world where monsters of human and marble flesh exist, how can it be? Well, technically not pulling, but definitely re-writing. I’ve given it a lot of thought. I was actually going to do this once I got the 13th chapter of my main WIP out (So it wouldn’t that bad of a shock, after all I already warned of a hiatus on its way), but so far I haven’t been able to churn out anything that could pass as a chapter that’s “in- character” in regards to the present version of my fic. It’s just…not working. No matter how hard I try to write ch.13, I keep going back to my old copies of chapters one, two, and three and re-writing them. Hell, I’m already on ch.4. I’ve looked at my early chapters, compared them to the most recent ones, and realized that the flow, the tone of the writing itself, doesn’t match. I had a completely different mindset when I began, still figuring things out, still not setting things in stone, and throughout the experience I learned a lot. More so if I hadn’t posted in the first place. A huge learning experience, I guess you could say. It made me remember why I wanted to write this story in the first place, and that because I was under the impression I had to conform to a framework because it was fan fiction, I put what I really wanted on the back burner in order to write/focus on what I thought was supposed to be written/focused on. And that’ s the truth. Resent isn’t about Twilight, at least, not completely. To the person who commented, thank you, by the way. You know who you are. Now, you may ask, “why post a wip in the first place?” well, the truth was, I didn’t think the fandom would still be around once I completed Resent. It was 2010, the twi-craze was already dying down somewhat, and I thought it would be risky to take my time and finish the story first before posting. I thought I was working on borrowed time. Plus, I wasn’t sure if the twist I had going with my main oc’s. would be received well. The reviews and the fact that a good number of us are still here kind of blows those pre-conceived notions out of the ballpark, to my sweet relief. What I said in past thread posts still stands: as long as the story is posted, it is not abandoned. Hiatus maybe, but not abandoned. The fact that it is still there means that I’m still a part of the fandom. If I ever decide to flounce, there is no way in hell that I would ever leave any of my writing’s unmonitored on the internet. If I ever decide to discontinue, you readers will be the first to know. I’m leaving the current copy of Resent on ff.net, twilighted, and twcs for these reasons, and also because I know there are some who still enjoy re-reading the posted chapters. I’m sorry if this is upsetting. I know the update schedule for this fic has been somewhat tumultuous and nail-biting, especially with how things were left the last chapter, but I feel like if I don’t say something now, I’m going to end up posting something bland and soulless. Once I’ve written enough of the new version (or completed it) I’ll pull the old version and start re-posting. I won’t hold it against you if you flounce, just don’t tell me that you are. Again, I’m sorry about this guy’s, but my gut is telling me this is something I have to do. It will be as if I never existed. Those fateful words changed the lives of Bella & Edward. What happened after those words were uttered? What happened during October, November, December, and January? How exactly did Edward end up in Italy? Get ready to embark on the heart breaking journey with a joyous reunion. What if everything went very wrong in Volterra? 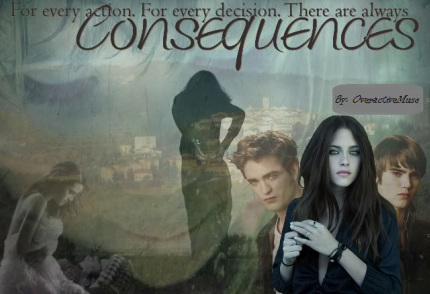 Edward's decisions have led to the death of two family members and Bella's becoming a vampire. The Cullen family has fallen apart. How can you live forever when you've lost those who you've loved the most? AU, hurt/comfort, non-canon pairing, B/J. Rated N-17 for "lemons". What do you do when the love of your life has no memory of you? Two years after they left her, Bella is back in the Cullens' lives. The only problem is that she doesn't remember them. A Bella and Edward love story. Years have passed since Edward left Bella in the forest. She's finally worked through her heartbreak but has never moved on to another man. She treats her best friend, Jake, like a beloved pair of old jeans. Jake is not happy with this situation. When he takes matters into his own hands, Bella's resulting epiphany makes her realize she needs to learn how to seduce a werewolf. I looked across the room in shock. My beautiful Jacob was smiling down into the eyes of that witch! He was giving MY smile to somebody else. MY smile! His hand was on her arm. How dare he?